Jeremy Sasson, founder and owner of Townhouse restaurants in downtown Birmingham and Detroit, plans to open Prime + Proper, an upscale steakhouse set at street level that will offer 100 percent USDA prime beef and lamb, along with jidori chicken, seafood, appetizers, side dishes, desserts, and traditional and craft cocktails, next spring in Capitol Park in downtown Detroit. In addition, there will be a private bar for up to 80 people in the lower level of the space called Cash Only. True to its name, the bar will be “fully enclosed, fully secluded, non advertised, and only made available via a door that the general public is unaware of,” says Sasson, founder and owner of Prime + Proper and Cash Only. Working with knife smiths and metal smiths, Prime + Proper will offer loyal customers custom steak knives that will be waiting for them upon each visit to the main dining room at Capitol Park Lofts at the southwest corner of Griswold and State streets. The 180-seat restaurant at 1145 Griswold St. will also offer 100 outdoor seasonal seats. “One of the bigger components of the restaurant is that we will dry age all of our meats in-house,” says Sasson, who will soon create Heirloom Hospitality Group in Birmingham to consolidate his restaurant holdings as well as offer catering and consulting services. “We will also prepare all of our charcuterie plates in-house. Prime + Proper (pronounced Prime and Proper, a take off of prim and proper) will include the main dining room along with a private dining room for between 30 and 40 people, a 16-seat bar, a 10-seat raw bar, a lounge for up to 70 people, the butcher shop, and an open, finishing kitchen. The lower level will include a second kitchen, the dry aging room, and Cash Only. The two-level space, that combined will span just under 11,000 square feet, is being designed by McIntosh Poris Associates in Birmingham. The main dining room will include such materials as “dark woods, light stone, finished and refined brass, a color scheme of black, gold, and white, with a touch of plum and sparks of cowhide,” Sasson says. The restaurant will be open daily for dinner, and include a happy hour. Down the road, plans are to offer lunch and brunch service. Some 120 employees will be hired, with the culinary team led by Chef Michael Barrera of Townhouse Detroit. In addition, there will be a wine sommelier working every evening. Sasson recently signed a lease for the space with Capitol Park Partnership in Detroit, which is converting the 11-story structure into 63 apartments and 17,000 square feet of commercial space. The apartments are scheduled to open in November. In addition, the partnership, which includes Richard Karp, Richard Hosey, and Kevin Prater, is renovating the Farwell Building in Capitol Park into 82 residential apartments, office spaces, retail and restaurant areas, and a rooftop deck. It is projected to open in fall 2017. 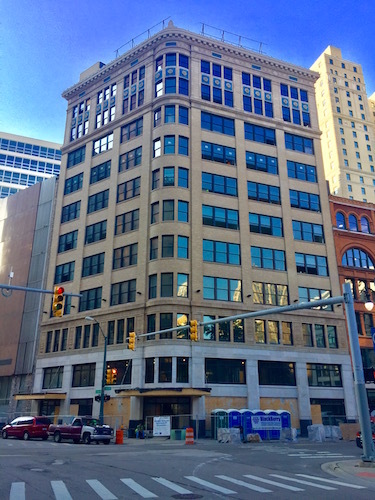 In summer 2015, the group completed renovations to the Detroit Savings Bank building at the northeast corner of Griswold and State streets into 56 loft apartments and office space. It also owns the 140-space Griswold Parking Garage, and is planning to build two midrise towers bordering Capitol Park in the future. With the additions, along with numerous other building upgrades around the park by Bedrock Real Estate Services, Broder & Sachse, and Lear Corp., every structure that borders Capitol Park, site of the state’s first Capitol before it was moved to Lansing in 1847, will have been renovated. The original Capitol building was converted into a high school, but following a fire it was torn down and replaced with a triangular park in the 1890s.